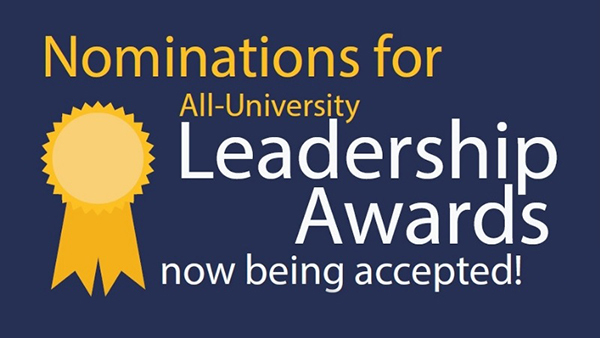 Help campus recognize its outstanding student leaders and advisers this year. Recipients will be announced at the 2018-2019 Leadership Recognition Celebration at 3 p.m. Thursday, May 9 in the Satellite Student Union. Complete the nomination form online NOW! 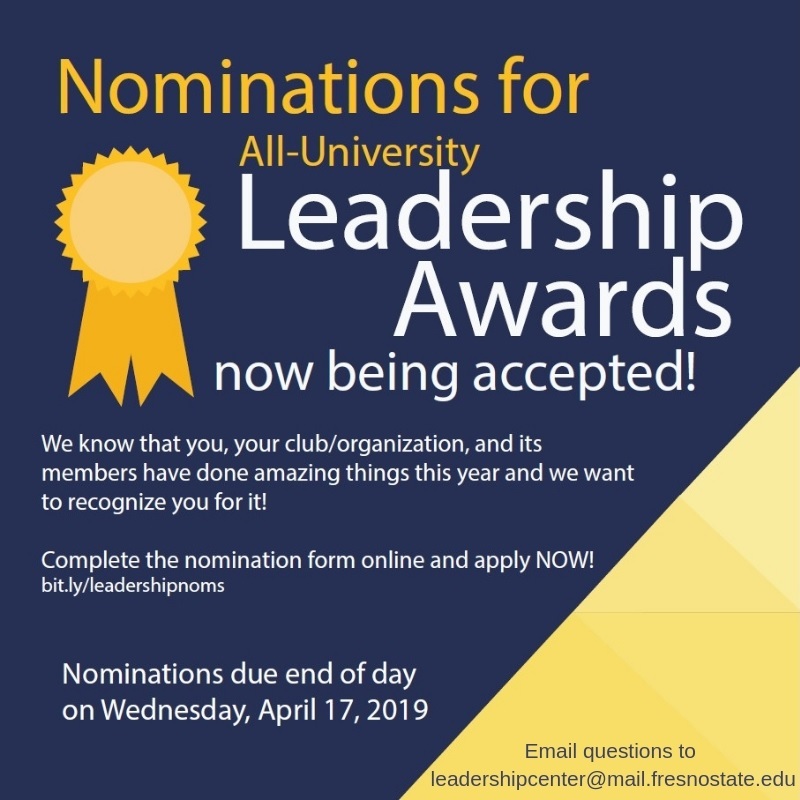 Nominations are due no later than 11:59 p.m. Wednesday, April 17.
Who can submit nominations? Any Fresno State student, staff, or faculty member can submit a nomination. Self-nominations are also accepted. Primary nominators can access the nomination form by clicking here. Can I upload my written statement or letter of support? Yes. Both primary nominators and supporters can upload their letter of recommendation via the upload feature on the OrgSync form. How many letters of support are required? Only one written statement (typed into the OrgSync form or uploaded) from the primary nominator is required. Additional letters of support can also be submitted, but are not required. Note: Additional letters of support are submitted via a separate OrgSync form which is generated upon completion of the primary nomination. Please submit the primary nomination with enough time for additional letters of support to be completed before noon Friday, April 19. How are additional letters of support submitted? Additional letters of support are also submitted via OrgSync. The primary nominator will be asked to provide the email address of additional supporters who will then receive the link to complete their letter of support online. The supplemental letter of recommendation form can be accessed by clicking here. Note: It is the responsibility of the primary nominator to ensure all materials are turned in on time. All participants are welcome. If you need special accommodations or need more information, contact Sophie Karas at skaras@mail.fresnostate.edu or 559.278.0341.